HOGZ United Charities, Inc. (HOGZ U.C.) 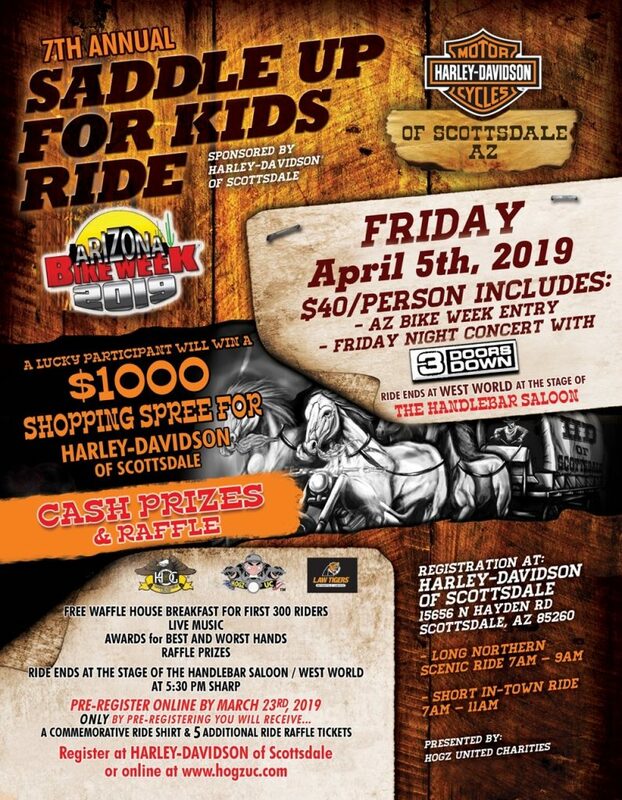 has teamed up with Harley-Davidson of Scottsdale to announce the 7th Annual Saddle Up For Kids Ride to be held on Friday April 5, 2019. The “Saddle Up For Kids Ride” will start at Harley-Davidson of Scottsdale 15656 N. Hayden Rd., Scottsdale, AZ. This fantastic ride will cross over 235 miles, covering some of Arizona’s most scenic highways plus a optional short ride for those who want to spend more time at West World. Proceeds benefit Hogz United Charities, Inc. and children of Arizona who need our help. The ride fee will include a FREE Breakfast, served at the dealership, by Waffle House, Entrance into West World for that day. Which the party starts there. Live music, also T-shirts for Pre-Registration Participants, Cash Prizes and many raffle prizes. Not to mention every year we always throw some extra surprises for you. So if you are looking for a great ride with some awesome giveaways, select the links below. REGISTRATION fee is per participant. 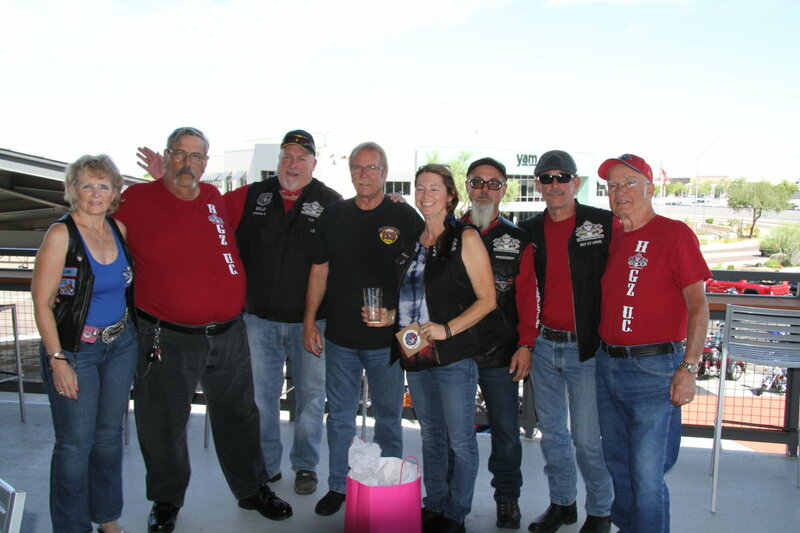 Hogz United Charities, Inc. and friends feel that this is our most rewarding endeavor, to provide help to children here in our Arizona community. Your participation and sponsorship are greatly appreciated. We are also in need of your help in soliciting sponsorships and in the direct donation of raffle items. This will be an enjoyable day for everyone and will present many rewards for all who participate. Your support is greatly appreciated. Please review the Registration Form link found below, and is also included is our Sponsorship Packet. Each Participate Must Provide Their Drivers License and Insurance Along With a Signed Release Form. Please Have Them With You, Present Day Of Registration along with Signed Release Forms To Make It Easy For You, Print Now And Have This Release Form Ready Day Of Registration. Get your release form to fill out HERE. Download the Ride Flyer HERE. Download the Mountain Ride Map HERE. Download the Desert Ride Map HERE. We are sorry but pre-registration is currently closed. However, you may register on the day of the event! Go to Scottsdale Harley Davidson on April 5th! 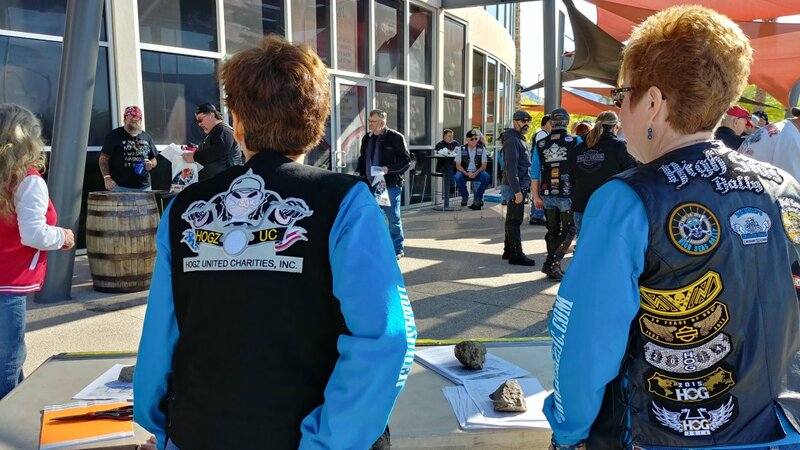 All of us at Hogz United Charities, Inc. as well as the good people at Scottsdale Harley-Davidson thank you for your participation. 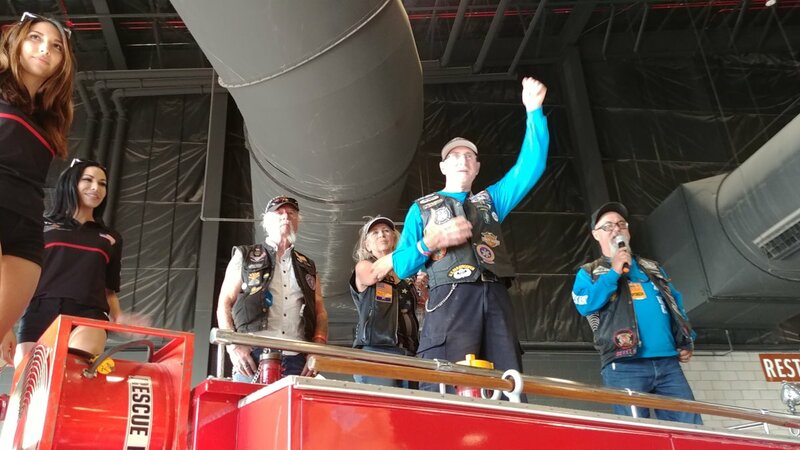 We all look forward to seeing you at the Arizona Bike Week 2019 Events!